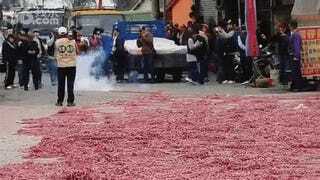 Recently, folks in China and Taiwan covered the main streets of their villages with tens of thousands of firecrackers. Then, they lit the fuse, engulfing the street in explosions and smoke. The local tradition, That's Online explains, wraps up the annual procession of the area's guardian deity. According to Kotaku reader Bruce Hsu, the firecracker festivities held in Taiwan even made the TV news. Maybe turn down your volume and do not try this at home. Or anywhere. According to That's Online, there was a similar display in Shantou, China. That's Onlineadds that the Chinese government has become increasingly strict about Chinese New Year's fireworks displays, and while online, Chinese internet commenters did acknowledge that this was a regional folk tradition, some still thought it was "pretty stupid" and said it caused pollution. In the video below, via Sina, you can see what this sort of firecracker display looks like from a rooftop view. It looks dangerous! Thankfully, the village made it through this year's celebration, buildings and people intact. Update: An earlier version of the story stated the video was filmed in Shantou, China. As Kotaku reader Bruce Hsu pointed out, it was filmed in Taiwan.